This is a very tangy everyday balsamic vinegar. The vinegar flavor is very pronounced. This would be a good balsamic for making salad dressings and reductions. I would not recommend it for drizzling directly on food as the vinegar overpowers the sweetness. This is very thin and watery in consistency. Size – 17 fl. oz. Description – Product of Italy. The mixture is matured in barrels made of various types of wood and undergoes a strictly controlled decanting process to give the vinegar its unique taste and fragrance. I’ve bought Balsamic Vinegar of Modena from Trader Joes for many years and today I threw about 1/3 bottle down the drain because it turned clotty. When I poured it, clots of vinegar substance dropped out, so I poured what was in the bottle into a glass and there were many large and small “clots”. I keep this bottle in an enclosed shelf, no light or heat…I have another bottle which I will open and hope this doesn’t happen again. What is the problem? Why did it clot? Should I keep it in the refrigerator? This had never happened before and I’ll have to change brands if it does again. Good stuff, but clotts….yuk! I buy a lot at Trader Joe’s in Thousand Oaks and lately I bought a bottle of Trader Giotto’s B.V. of M. and it is sour. There is no expiration date visible but a number, which is L20315 -14:13. The vinegar is sour and I am wondering where you hide the expiration date? 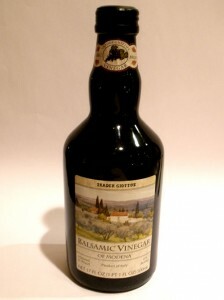 Previous post: Balsamic Vinegar or Balsamico Tradizionale, What Is The Difference?